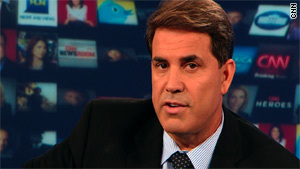 Anchor Rick Sanchez left CNN on Friday, one day after making controversial comments. CNN: "Rick Sanchez is no longer with the company"
Sanchez's 3 to 5 p.m. daily spot will be filled by "CNN Newsroom"
Atlanta, Georgia (CNN) -- CNN anchor Rick Sanchez abruptly left the network Friday afternoon, just one day after making controversial comments on a satellite radio program. "Rick Sanchez is no longer with the company," according to a statement from CNN. "We thank Rick for his years of service and we wish him well." On Thursday, Sanchez appeared on the XM Sirius radio program "Stand-Up with Pete Dominick." During the interview with Dominick, Sanchez called "The Daily Show's" Jon Stewart "a bigot" and then said that he was bigoted against "everybody else who's not like him. Look at his show, I mean, what does he surround himself with?" Dominick pressed for specifics, and Sanchez, who is Cuban-American, responded, "That's what happens when you watch yourself on his show every day, and all they ever do is call you stupid." Dominick, who was once the warm-up comic at Stewart's Comedy Central show and now has a spot on CNN's "John King, USA," noted that Stewart is Jewish and so a minority himself. "I'm telling you that everybody who runs CNN is a lot like Stewart, and a lot of people who run all the other networks are a lot like Stewart, and to imply that somehow they, the people in this country who are Jewish, are an oppressed minority? Yeah," Sanchez responded. The comments were widely quoted online and on social media. Sanchez's 3 to 5 p.m. daily spot will be filled by "CNN Newsroom" for the "foreseeable future," CNN said.